Old Man Emu steering dampeners (stabilizers) mount directly to the OEM location, making it the easiest unit to install, and eliminating the need for extra hardware. 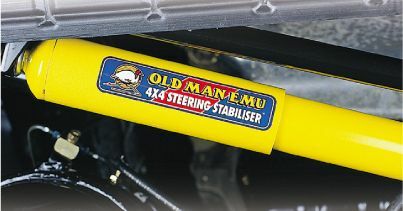 The Old Man Emu Stabilizer unit incorporates the same Twin Tube, Low Pressure Gas design as their shock absorbers, only with a 50/50, neutral, 9 stage valving. Also there is the steel stone shield as used on Old Man Emu shock absorbers to help prevent shaft damage from stones or debris that a boot simply will not protect against. Works for: XJ/YJ/TJ/ZJ.